Oscar parties are fun -- boozing it up with friends, gorging on seven-layer taco dip, shouting at the TV when your favorite Hollywood star mounts the stage -- but the show itself can be excruciating. Long sentimental speeches paired with the host's unfunny jokes could slip you into a coma. However, there's a workaround: the Internet, of course! From online polls to streaming coverage to iPhone apps, multimedia has a lockdown on the Oscars. Chiff.com also has a bunch of suggestions for pimping out your party, like tacking up movie posters and prepping elaborate meals. Are you more inclined towards intoxication to help you through the night? Check out these Oscar-themed drinks at the site That's The Spirit. With so many Oscar-devoted Web sites out there, it's hard to narrow down the most useful and engaging. Obviously the official site, Oscars.org, features the most comprehensive examination -- but it's a bit bland. The science of movies? Zzzzz. The Envelope, one of the LA Times' blogs and my personal favorite Oscar site, hosts a slew of snappily-written pieces that are sure to grab your attention, like an article explaining how the best picture is picked, and a great use of intelligent multimedia, like its video roundtable of directors including Quentin Tarantino and James Cameron. Want more snark? Keep an eye on sites like Gawker's Defamer blog (with its foul-mouthed guide to winning your Oscar pool) who will live-blog the Oscars, and Perez Hilton (barf), who live-blogs everything, for instantaneous updates designed to tear apart celebrity souls. Fashion-minded individuals should stick with Fashionista for its live blogging. 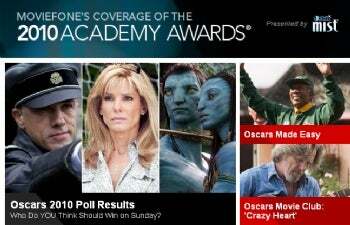 Moviefone's comprehensive site gives readers an exhaustive look into the movies and ceremony. It's almost too busy. With newsfeeds, videos, interactive polls, links, movie showtimes and more, you're apt to melt your brain combing through it all. Twitter has been insanely busy since Friday, which was designated by the San Francisco Chronicle as Oscar Friday. Modeled after Follow Friday, wherein Twitterers publicly recommend other micro-bloggers to follow, Oscar Friday was a chance to build a meme and get followers by using the hashtags #OscarsFriday or #OF. You can also expect millions of Twitterers to use #Oscars during the awards. But curiously absent from the party is the Academy itself. Why doesn't it have a Twitter account? Have no fear: Adam Shankman, producer of the Oscars, has a Twitter account that's likely to be rife with interesting blurbs. E! Entertainment, paired with Google, will also be pulling an interesting stunt: real-time tweaks to E! 's Internet ad campaign. So if an actress happens to be wearing something fabulous (or fabulously horrendous), E! 's Web site will morph its Oscar-related ads in moments so chronic ad-clickers will know where to buy the dress, how to accessorize, and more. Given the amount of attention E! plasters on events such as these, it should be a remarkable experience watching advertisers try to steal your wallet in a new and innovative way. The Associated Press partnered with AT&T and Livestream to create an embeddable video widget, accessible via the Internet, with live feeds, social media elements, on-demand clips, photos, and news. The Livestream widget can also be accessed via your BlackBerry, iPhone, or Android handset's Web browser, and will be posted on Facebook and AT&T's entertainment site. Of course, there are a multitude of ways to watch the Oscars on the Net, and Technically Personal has put together a list of 15 ways to watch the 2010 Oscars online for free, including Hulu and TV.com. You might also keep tabs on the official Oscar 2010 YouTube channel. This useful -- and free! -- app from the Academy of Motion Picture Arts aggregates Oscar night essentials, including winner predictions, nominees lists and trailers. The best part is the social networking features: you can share and comment on your predictions through Facebook, Twitter, SMS and e-mail, plus real-time community results to compare your choices with other app owners. For more clutter on your phone, scope out TiPb's list of Oscar-related iPhone apps. With so many techie ways to enjoy this Sunday, you barely have an excuse not to tune in somehow.